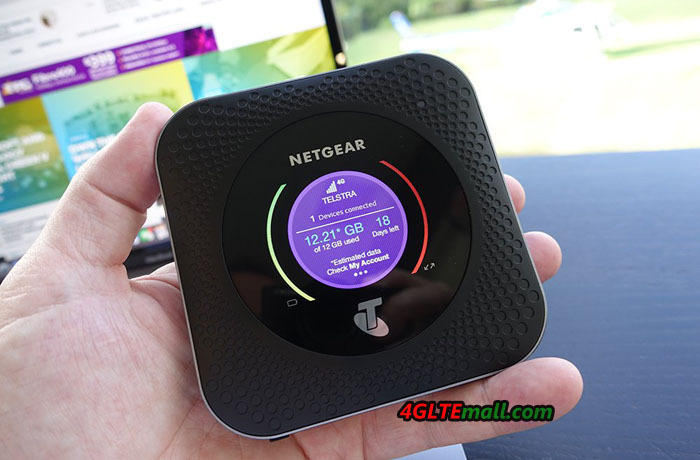 Netgear introduced the Nighthawk M1 LTE Hotspot –the world’s first Gigabit LTE router a few days ago. The Netgear M1 with model number MR1100 has a Qualcomm modem with LTE Category 16 and reaches speeds of up to 1 Gbit/s in the downlink under correspondingly developed mobile radio networks. Up to 150 MBit/s can be achieved in the uplink. 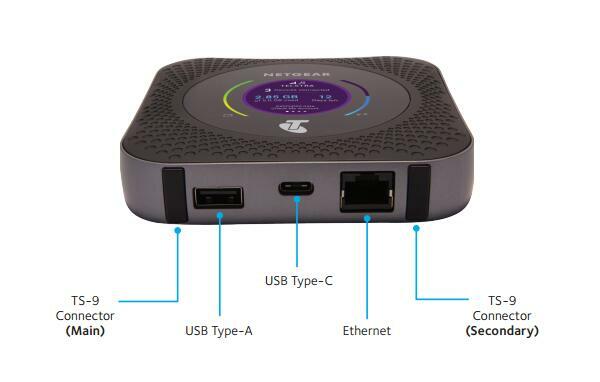 Also the other technology of the M1 hotspot is very up-to-date, for example, there is a Gigabit RJ-45 LAN port, dual band WLAN-ac and a removable battery. 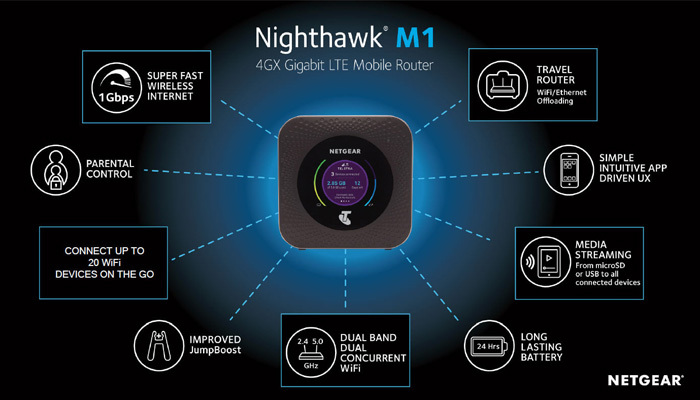 The Nighthawk M1 is currently available only in Australia by Telstra. The Netgear Nighthawk M1 MR1100 differs significantly from the other Netgear LTE Hotspots in the “AirCard” series. The Nighthawk M1 router is in square shape, about 10cm wide, 2cm high and 240g heavy and offers in the center a 2.4 inch round color display. The core feature is Qualcomm’s modem, which supports 4.5G or LTE Advanced Pro with LTE Cat16 (up to 1 Gbit/s downlink and 150 Mbit/s uplink). These high speeds are supported by the 4 × 4 MIMO, 4-Band Carrier Aggregation technologies and 256QAM modulation, but the mobile network must support these features in order to reach the maximum bandwidth. The hotspot of course also works in mobile networks using, for example, only 2 × 2 MIMO and 64QAM. The Netgear Nighthawk M1 Hotspot has a 5040 mAh battery and supports the Qualcomm QuickCharge 2.0 technology. With the help of a QC 2.0 capable power supply, you can charge the battery up to 75% faster than with a regular power supply according to Netgear. The operating time has been further improved by the strong battery compared to the predecessor AirCard 810, with one battery charge, the Nighthawk M1 can keep working for a full day (around 24 hours). Unfortunately, the Netgear Nighthawk M1 LTE mobile router is not compatible with the Netgear DC112A docking station, although it is not available for so long. With the DC112A, one can connect Netgear LTE hotspots such as AC785, AC790 or AC810 and thus turn into a full-fledged stationary LTE router. After all, the Nighthawk M1 with the integrated RJ-45 LAN port offers an alternative and is also suitable for stationary use. 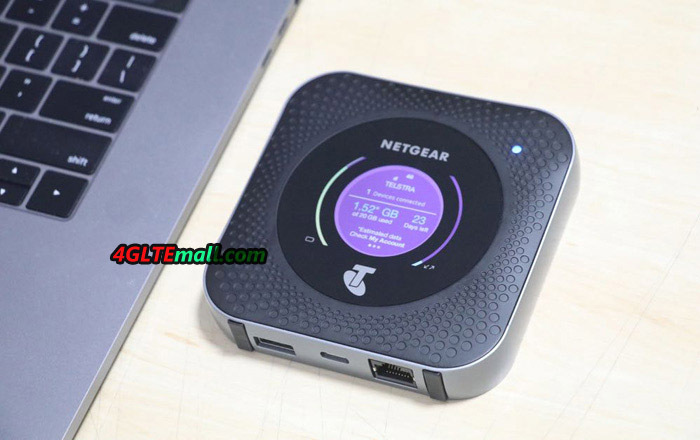 Currently, the Netgear MR1100 Nighthawk M1 Hotspot is only available in Australia with the local mobile network operator Telstra. 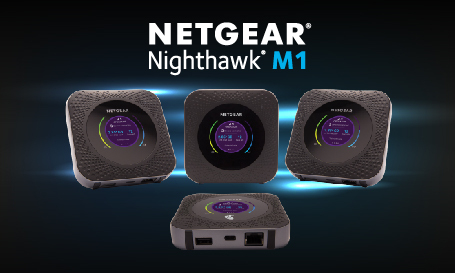 According to the information from somebody who was able to watch the Nighthawk M1 at the CES in Las Vegas, the Netgear M1 Gigabit mobile router would be available for more carriers in Europe. Since many carriers over the world haven’t provided the 1 Gbit/s on all networks, the full LTE Cat16 performance of the Netgear Nighthawk M1 will not be available for the time being. Even though, considering the strong battery as well as the RJ-45 LAN connection, user can benefit even in slow mobile radio networks!